Cloudified reconstruction of telecommunications networks is already the consensus of global operators. Virtualization technology brings many advantages such as cost reduction, flexible scale-in/out. However, with the advent of 5G, new challenges and problems are constantly emerging. 5G has three major application scenarios: enhanced Mobile Broadband (eMBB), focusing on 4K/8K HD video, VR/AR and other high-bandwidth services, requiring a transmission rate 10 times faster than 4G; High Reliability and Low Latency Communications (uRLLC), focusing on high-reliability and low-latency services such as self-driving car and telemedicine, requiring a delay as low as 1 millisecond; massive Machine Type Communications (mMTC), focusing on smart city, smart home and other massive connection services, requiring to support accessing 1 million devices per square Kilometers, 10 times that of 4G. Therefore, 5G networks need to have higher performance and more powerful management capabilities, and also need to be flexible and intelligent to meet a wide variety of application scenarios. At present, the early NFV network infrastructure cloud solutions have bottlenecks in many aspects, and need to be further reformed in terms of deployment architecture, network performance, and operation and maintenance (O&M) convenience. 5G completely realized control and user plane separation (CUPS), driving the network evolving to a distributed deployment architecture. On the one hand, flexible and high-performance edge nodes are built at the edge of the network to get close to end users: through the local offloading of high-bandwidth services such as 4K/8K and AR/VR, the occupation of the core network and backbone transmission network is reduced, and the utilization rate of bandwidth resources is effectively increased. The high-speed processing capability is moved to the edge, effectively supporting services requiring ultra-low latency such as self-driving car and telemedicine; in addition, edge nodes need to be flexible and scalable to meet diversified 5G application scenarios. On the other hand, a network-wide intensive central node is constructed: providing a resource pool shared across regions, effectively improving resource utilization; achieving efficient centralized management of massive nodes, and coping with the rapid development of network scale; at the same time, the central node also supports to build an capability exposure platform to provide digital services, to help operators achieve value innovation. Therefore, a distributed deployment architecture with features such as flexibility, high performance, and high efficiency will be the main development trend of telecom cloud network. Early telecom network cloudification solutions turn traditional network infrastructure based on dedicated hardware into the unified resource pool based on common X86 servers, breaking down resource silos and achieving flexible resource scale-in/out. However, with the advent of 5G, facing the challenges from the performance requirement for ultra-low latency and exponential growth of service scale, common servers lose competitive edge in performance and cost. Hence, hardware acceleration technology is tightly concerned by the industry. Current mainstream hardware acceleration technologies include: offloading the data switch function of virtual switches in the telecom cloud platform to the FPGA SmartNIC, to improve forwarding performance; introducing the Graphics Processing Unit (GPU) into the unified cloud resource pool as a kind of high-performance computing resource, to make full use of GPU’s excellent processing capabilities to improve the computing capability of the telecom cloud platform, so as to provide better support for HD video, AR/VR and more services; using ARM processor virtualization and other technologies. The new-generation telecom network cloudification solution should converge these hardware acceleration technologies to comprehensively improve forwarding performance and computing performance. 5G drives network functions (NF) moving to edge nodes close to end users. This trend leads to the dramatic growth of edge nodes by ten times even hundred times, and the O&M workload gets doubled accordingly. Besides, after the cloudified reconstruction of network structure, though layered decoupling significantly reduces hardware costs, more complicity is brought to O&M work. Therefore, telecom operators are looking for more efficient O&M approaches. To this end, the deep application of AI technology becomes the key driven force for constructing automated, intelligent O&M. The AI technology is capable of analyzing multidimensional complicated problems across layers and domains, and brings higher processing efficiency to multiple aspects of O&M through rapid root cause analysis (RCA), real-time dynamic resource adjustment, capacity predication and analysis, and gradually fully automated O&M mode, to release manpower continuously and reduce OPEX effectively. 5G NFs will be based on components and microservices. With advantages of less resource occupation and easy migration, container is considered as the resource carrier more fitting to 5G microservice architecture. However, container technology is not mature enough in the telecom field, as it has weaknesses in orchestration capability, security and other aspects. Moreover, most of present cloudification projects use VM solutions which have developed and evolved in long-term practices and have many advantages. Thus, the two technologies are both important to 5G, and the industry is exploring how to make selection and balance between them. To address such challenges, ZTE promotes the 5G-Ready 4MIX distributed cloud infrastructure solution. It is based on the distributed architecture with“Core Cloud + Edge Cloud + Access Cloud”, and integrated with HCI, container, hardware acceleration, AI and other advanced technologies, to build the 5G-Ready cloud infrastructure featuring green, energy-saving, flexible adaption, performance acceleration, intelligence, and high efficiency. MIX Deployment Modes: for different DC scale requirements, providing matched deployment solutions rapidly and accurately, such as automated large-scale deployment for center cloud, and green lightweight deployment for edge cloud. MIX Resource pools: combining two mainstream open source cloud platforms, OpenStack and Kubernetes, to build the integrated resource pool, to carry out unified management and orchestration of VM, bare metal, and container sources, and flexibly allocate resource according to demands of upper layer applications. MIX Hardware: combining X86 servers and acceleration hardware such as FPGA organically, and carrying out unified management through the same cloud platform, to significantly reduce hardware investment and guarantee high performance of the network, so as to bring the most cost-effective solution. MIX O&M Modes: by virtue of remote control, AI and other technologies, building the end-to-end closed-loop automatic O&M for the entire distribute cloud, to bring the efficient O&M mode with unmanned remote site + centralized control at the center. The 4MIX distributed cloud solution provides 5G scenarios with precise deployment solutions to flexibly match diversified demands, to achieve the best match of user experience and cost control, to give a big push to the construction of 5G-Ready cloud infrastructure. 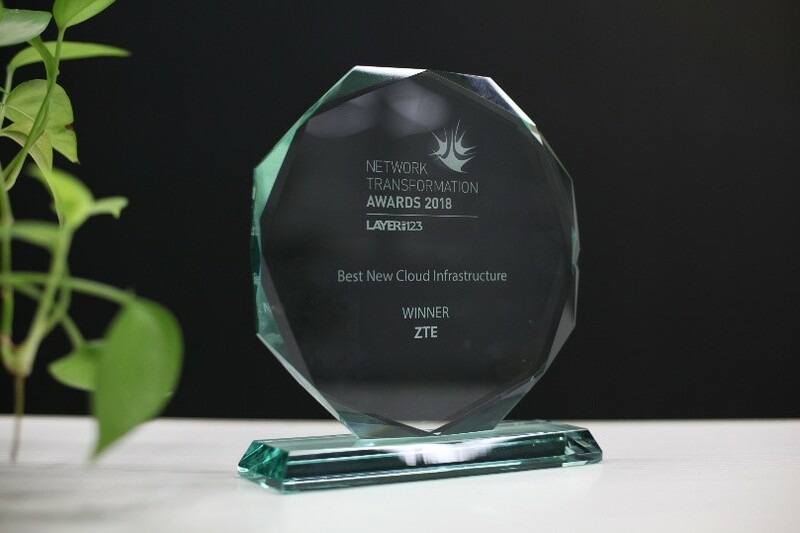 This solution won the “Best New Cloud Infrastructure” at the SDN NFV World Congress 2018, fully recognized by industrial authorities. As the world’s leading provider of integrated communication solutions, ZTE is committed to building 5G core technology capabilities, actively applying in practices, and has been cooperating with many of the world’s leading operators. ZTE will continue to increase investment in research and development, promote the development of advanced technologies, and accelerate the commercial pace of 5G in the future.